Though the realty sector of the federal capital has been showing slow progress over the past few months, it is still not devoid of lucrative investments options and promising real estate projects. Investment activity in Islamabad is somehow slow these days, however, this situation is anything but permanent. Simply put, the property market is unlikely to lack luster for long. 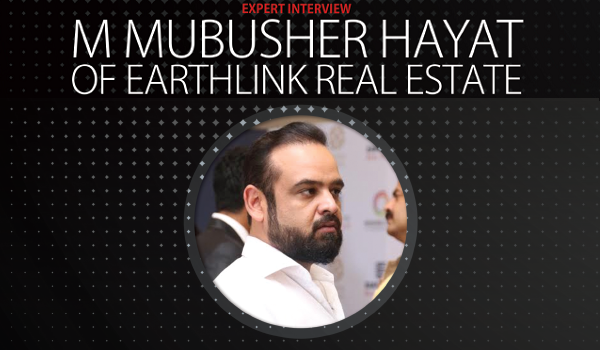 In order to discuss the ins and outs of the federal capital’s property market, Zameen.com conversed with Earthlink Real Estate CEO M. Mubusher Hayat. Hayat began his career in real estate in 2004. Immense knowledge of the field and enthusiasm helped him climb the rungs of success within in a short period of time. His very own Earthlink Real Estate is one of the trusted real estate firms in Islamabad. Zameen.com is grateful to Hayat for taking the time to share his knowledge with us. Zameen.com: Islamabad’s real estate sector has been showing slow performance for the last few months. What would you like to say about it? Mubusher Hayat: The realty sector of the federal capital has been showing mediocre numbers for the past few months and several factors may be a cause to it. A correction in the market was due, though it has not occurred yet. Even political factors have also affected the property market adversely. I believe the situation will persist for another year or so, and the market will remain more or less stable. However, after that, an acceleration in prices can be expected. Zameen.com: Islamabad hosts a multitude of mixed-use buildings. Do you think these projects are promising for investments? MMH: From developer’s point of view, these buildings are high revenue generators as they have both residential and commercial units on offer. Investors are usually on the lookout for capitalising on commercial units to earn rental yields. Residential units, on the other hand, remain popular among homebuyers in such buildings. Zameen.com: Which societies in Islamabad are best for investment and why? MMH: I would straight away rate Bahria Town as an optimal investment. Phases VII and VIII of Bahria Town are worth considering for investment in the current scenario. And those who do not wish to invest in Bahria Town can find good investment options in Gulberg Islamabad. Bahria Town is currently offering the best rates possible, while Gulberg Islamabad has an edge because of its attractive location. Zameen.com: Since you deal in Bahria Town, please comment on the current controversies the society is embroiled in. MMH: Controversies have always existed and if they were legitimate, Bahria Town would have taken appropriate actions. The developer has always countered contorversies by delivering its projects. Its competitors will keep on defaming it. Zameen.com: How is DHA Islamabad faring among other societies in the federal capital? MMH: DHA Islamabad has finally started performing well after a long time. The developer’s prime focus is on building a beneficial relationship with investors. DHA Islamabad is a safe investment and prices the DHA’s projects are expected to grow further in the future. Zameen.com: Do you think the increase in taxes as proposed in the Budget 2016-17 will have an impact on the property sector of the country? MH: In my opinion, this will have a minute impact, however, the impact will be symbolic. The real estate sector is used to dealing with tax increases and it has always come up with viable solutions. Investors will probably be discouraged, but at the end of the day, they will get used to paying increased taxes. So, increase in taxes will slightly dazzle the property market, but it will come out of this phase within a short time. Zameen.com: What role do you think Zameen.com plays in the development of the property sector? MH: Zameen.com has completely revolutionised the property sector and one of the biggest accomplishments of the website is to provide overseas Pakistanis with an easy access to local agents and property buyers/sellers. The portal has changed the way the real estate business is conducted with both their online as well as offline activities such as expos and other events.